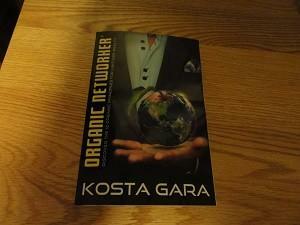 Today’s I want to do a detailed book review of “Organic Networker®” by Mr. Kosta Gara. As a quick disclaimer, I was sent a review copy of the book for free. I was not compensated in any other way than that. I have never met Kosta Gara in real life personally, nor have I been affiliated with him in any of his business ventures. Also, the term “Organic Networker” is a registered trademark that belongs to Mr. Gara. I received this book last Thursday and read it over Memorial Day weekend. It took me about four days to read. I enjoyed the book immensely. The first section covers his 12 organic principles for success, why network marketing, choosing the right company, getting plugged in and launching your business. The second section covers building positive relationships, the 3 Q’s of organic recruiting, giving praise and criticism, and organic partnerships in network marketing. The third section covers building locally, but thinking globally, how to wine and dine, travel and entertainment secrets, and how to conduct successful events. The fourth section covers managing your time and life, how to become a master communicator, how to maximize your ROI and the art of negotiation. The final part of the book is growing forward. In this section, I would like to share some of my favorite Kosta Gara quotes from the book “Organic Networker®.” Each quote is in bold and italics. After each quote I will share my own thoughts on the subject. # 1 I have sponsored hundreds of potential leaders into my network marketing business that failed because they didn’t prepare or weren’t organized. Being mentally prepared for the hardships you will face and endure is vital to your success in network marketing. Talent alone will only take you so far. Learning how to be organized and manage your time effectively is vital as well, especially if you have a day job and family. # 2 Focus and dedication are the two most essential ingredients that you must incorporate to sustain the level of discipline necessary to achieve success in this industry. Very few people are good at staying focused and disciplined after their initial enthusiasm fades. That’s one of the reasons so few people do well in this industry. You must keep the main thing the main thing and never look back. # 3 An activity you must master to earn $10,000 per month is to make 10 prospecting calls, warm or cold market, six days per week. This is a numbers game. PERIOD. I’ve never met anyone who contacted 10 new prospects a day, every day, who failed in their business. Most people in our industry don’t contact 10 people per year, let alone 10 per day. # 4 I will guide you toward your goals, but it is not my responsibility to motivate you. You are not responsible to motivate your team. All you can do is inspire them by your own personal example. Each person needs to learn how to motivate themselves. # 5 Having the willpower to pursue your vision until it becomes a reality takes persistence. Nothing worth accomplishing in life is fast, free or easy. You must have a strong why and see things before they exist, if you want to eventually succeed. There will be many ups and downs, setbacks and temporary defeat on your journey to success. # 6 To make a million dollars you need to make a million friends. The more people you serve the more money you make. That’s the real beauty of this business. Become a people person. Focus on meeting new people and then meeting their friends. # 7 The responsibility to improve your life is yours and yours alone. We are all the Captains of our own lives. We must take 100 percent responsibility for our own lives, and stop making excuses, if we want to achieve great things in life. # 8 In order to become an organic leader, you must first identify your why, which is the foundation of your business. You need a why that will make you cry. This is the only thing that will keep you in the game as you go through the struggles and setbacks. # 9 And, in the beginning of your career, respect the fact that you might not do very well, but if you will draw a line in the sand and dare anyone or anything to try to stop you, you will improve and grow. Whenever you start a new career, you must go through a learning curve. This can last anywhere from six months to a few years. Each profession requires a certain set of skills that take time to develop. Have patience. Put in the work. Things do get easier. Work on your skills and get a little bit better every single day. # 10 In the early years of growing your business, you may feel like you’re not producing results. Don’t give up; the root system is developing! Eventually you will experience massive growth. You have to build your foundation before you can build a big business. It can take a year or two to build the foundation of a modern day skyscraper, yet once the foundation is built the rest of the building goes up quickly. That’s exactly how your network marketing business works. # 11 People join the organic networking profession mainly because of the people they know, and they stay in this profession because of the people they meet along the way. The people are the best part of this profession. Most people are recruited by their warm market. Most people stay in the industry because of the relationships they have developed with the people in their team. # 12 You can predict the future by looking at the past. People’s past performance is typically a good indicator of future performance. Maybe not in every single case, but most of the time. People who are successful in their life, business or career prior to joining MLM normally do pretty well in our industry. # 13 You are either committed or not. Most people are truly not committed to their business. They’re quick to put the business on the back burner and let life get in the way, even for the smallest of things. # 14 It is vital that you embrace the fact that there isn’t a profession on earth that doesn’t require staying plugged in to the latest literature, industry magazines, trends, breakthroughs, techniques, journals, and attending seminars, conferences, workshops, training courses and license updates. You need to be a student of your business, just like people in other professions do. Read books, attend events, counsel with your mentor, watch helpful videos and learn everything you can about your company, the products and the industry. # 15 Without question, the greatest teachers are also the best students. You must be the student before you can become the teacher. First you are the apprentice, then the master. # 16 If you dream about reaching millionaire status, know that it will require at least five years of commitment at full throttle. Good things take time. Taking five years to become a millionaire is a great deal, especially since you are doing the business part-time. Most people aren’t willing to put in the required amount of work to get to this point. # 17 A turning point for me was when I began setting goals. Set written goals for your life and business. From personal experience, I’ve been setting written goals for almost fifteen years now, and it has changed my life for the better. # 18 Be your # 1 customer, a living testimonial for your product. Be a product of the product. If you don’t use the products yourself, don’t expect anyone else to either. Be your own best customer and use all of your company’s products. This will help build up your belief in the products and give you a good product story to share with others. # 19 I have always believed that today’s preparation is tomorrow’s success. Preparation is key to success. You need a plan. You need to practice. You need to make a lot of mistakes and learn from it. Most successful people have spent YEARS in the trenches mastering their craft. # 20 There is a connection between the effort you make today and the success you find tomorrow. You must sow before you can reap. The money you are making today in your business is a direct reflection of the work you did (or didn’t do) several months ago. # 21 Admit when you mess up and give yourself credit when you do well. Be responsible for your own actions, but don’t be too hard on yourself either. No one is perfect. Set high standards for yourself and focus on getting better every single day. # 22 If you feel responsible for the actions of other people, stop it! You cannot control what other people do or don’t do. Let it go. You can only control what you do. Focus on being a good personal example for others to follow, but don’t beat yourself up if they don’t follow your lead. # 23 If you don’t reach your goals on the first try, look for other ways to achieve them. Very few things in life go exactly as planned. Don’t change your destination; just change your route, when needed. # 24 Never take yourself too seriously. Learn how to laugh at yourself. Be serious about what you do, but don’t take yourself too seriously. # 25 You never know which prospect will pursue an organic networking opportunity with a vengeance. Never pre-judge people. You never really know who will be your next ACE. In many cases, people will fool you. The person you thought would crush it quits within three days and the person you never thought would succeed builds it big. # 26 A good leader will always find a way to turn a negative situation into a positive one. Look for the positive in everything. Let every obstacle and mistake serve as lessons learned. Behind every setback is an opportunity for a comeback. # 27 If you lead by example, people will line up to join your volunteer Army. People want to follow someone who knows who they are and where they are headed. People want to work with success minded people who are at the top of their game. Be the type of sponsor you want to recruit. # 28 All members of a family business should have clearly defined roles from the beginning. If you are working the business with your spouse, set clear boundaries about who is responsible for what. That way you can each stay in your lane and not step on each other’s toes. # 29 When it comes to making tough decisions, everyone in this profession needs a mentor. Seek advice from someone with experience, success and someone you trust. All successful people have a coach of some sort. # 30 At any point in my daily business-building activities, I have anywhere between thirty and forty quality and qualified prospects in my pipeline. Keep your pipeline full and you don’t need to worry about who gets in and who doesn’t. # 31 Your message to distributors and prospects not only needs to be clearly presented at your meetings, the basic setup and content of the meetings must also be consistent. Keep things consistent and predictable. Keep the same message every meeting. # 32 Your appearance is important when it comes to meeting new prospects. Dress to impress. You never get a second chance to make a first impression. Be the best you possible. # 33 Make it a standard policy that it isn’t your responsibility to solve your downline’s problems. It’s not your job to solve other people’s problems. When people in your team ask for help and advice, give it to them, but make them solve their own problems. # 34 Your success and financial future are directly related to the number of prospects you meet. Talk to more people. The more people you talk to the better off you will do in your business. The more people you talk to the more money you will make. # 35 People always want to do business with people who exude confidence in themselves. When you believe in yourself other people will want to follow you. Be someone worth joining. Be the type of sponsor you wish you had. # 36 We never accomplish anything on our own. This truly is a team sport. No one makes it to the top all by themselves. # 37 Investing in your team is one of the best ways to create excitement and momentum. Have contests and prizes for your team whenever possible. Don’t be stingy with recognition. When you reach momentum, double or triple your efforts and “ride the wave’ as long as you can. # 38 Refuse to waste time supporting people who are not producing results. Spend your time where it is deserved, not where it is needed. Work with the workers. 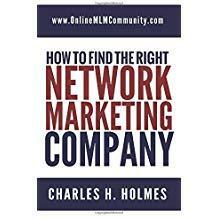 The book had a lot of great information that would benefit any new or experienced network marketer. It is well written and easy to read. It is well organized and to the point. There is no fluff. It’s simply great content. What I liked most about the book is that it focuses on the mindset and big picture thinking of successful network marketers. I know that is something a lot of people struggle with. No book is perfect. The only things I thought that could be improved in the book is if Mr. Gara spent more time talking about what he actually did to build his business. For example, where did he meet his prospects? What did he say to them to get them to join? How did he help them? What was his actual system? What scripts did he use? I think these are the things that people in our profession really want to read about. The only other thing I thought could be improved about the book was the ending. I feel like the book just ended with no summary or real conclusion. Once again, I am not being critical. Every book could be improved in one way or another. All things aside, I really enjoyed the book! 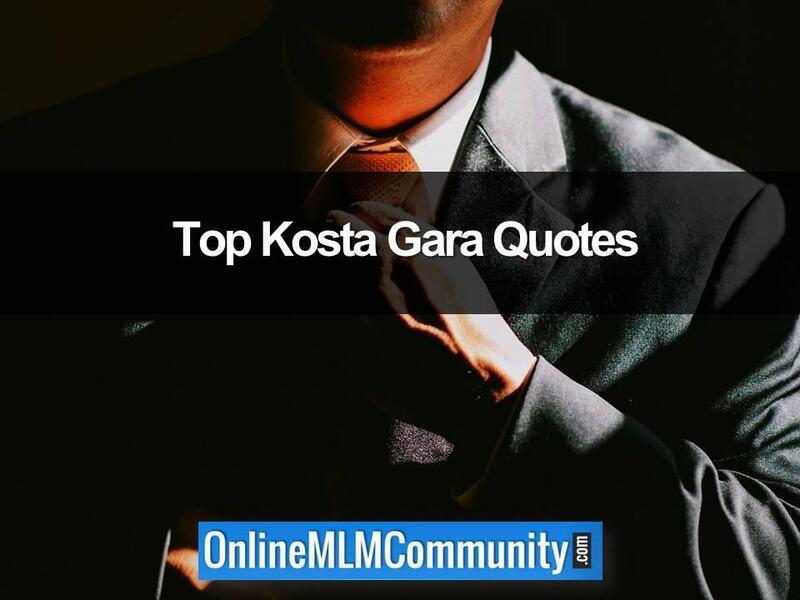 Kosta Gara is a legend in the network marketing industry. He’s built teams with hundreds of thousands of distributors in more than 30 different countries. He’s earned millions of dollars in our industry as a distributor. He is also a well respected speaker and consultant. Mr. Gara is the co-author of two best-selling books “More Build it Big” and “Guerrilla Multilevel Marketing.” He’s also been featured in Forbes, CNBC, and the Wall Street Journal. The “Organic Networker® is written by Kosta Gara. It is published by Bloomberg Publishing. The book has 239 pages. The ISBN is 978-0-9837669-0-2. The book is scheduled to be released on June 14, 2016. Overall, I give the book 4 of 5 stars and consider it a must read for any network marketer. It’s a great book to order a few copies and share them with your serious team members. When the book is released in June 2016, I suggest you order a copy and read it several times yourself. You will be surprised at what you learn. What are your thoughts? What is your favorite quote listed above? Leave a comment below to let me know what you think. I look forward to hearing from you. This does sound like it would be a book worth reading. I had not heard of Kosta Gara before until reading this post. #4: The fact is, none of us can motivate another person. Only the person can motivate themselves. We can give them positive affirmations that can help them choose to be motivated. #10: We may feel like we are not producing, but in all actuality, if we are following the plan, we are producing. It just may not be visible yet. #35: Confidence draws success and sales. Actually Chuck, all the quotes are good. And, if you read this Mr Gara…great job! Yeah, this was a really good book. I think you would like it.